Yesterday as I walked into my house for the umpteenth time I passed by the guardian of our home – a large stone Labrador staring at me with classic puppy-dog eyes. This “fierce” protector of our home that could rival any medieval church’s gargoyles was given to me by the Realtor who sold us our home. This was long before I became a real estate agent, but the lessons I learned from that transaction have stayed with me for the long haul. Her gift was better than a box of chocolates or a Hallmark card; I think about her whenever I walk by that kitschy Labrador statue probably procured at a local K-Mart store, and it always brings a smile to my face. It is funny the things that stick with us, and how the little things matter. I hope that each and every client we work with walks into a home with feelings of warmth and happiness, and whether our “Closing Gift” is a welcome mat or a bouquet of fresh flowers, I hope our home buyers truly DO feel welcome in their new dwelling. In my humble opinion, the best Closing Gift an agent can possibly give to a home buyer is simple, and it doesn’t cost a penny – it’s the feeling that their client made the right choice in a Realtor by hiring someone who truly cared about them. If there is anything our team can do for you, please let us know. 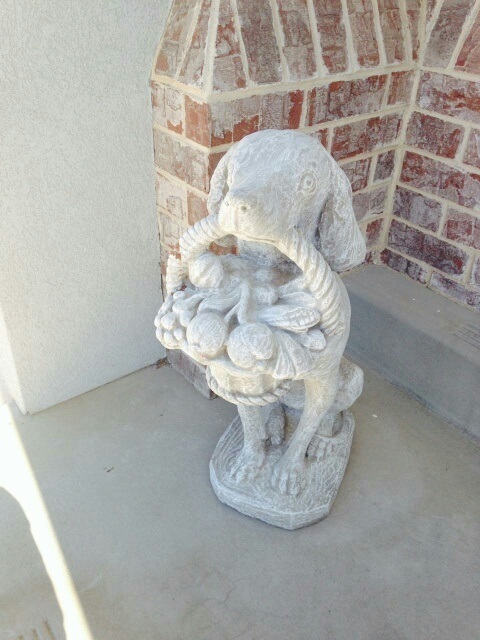 We may not be able to give you a stone Labrador statue for your front porch, but we might just help you find the home of your dreams.